Mining processes involve transferring of slurries that often contain solids in an excess of 80% by weight and have specific gravities (SGs) above 2.0. These slurries are highly abrasive in nature and corrosive. Verderflex peristaltic hose pumps are ideal for pumping such slurries since they have a highly engineered, reinforced hose and are highly resistant to the abrasion of slurry particles. The copper mining company initially installed a few of VF50 models and they were found to be highly successful in transferring the corrosive slurries. 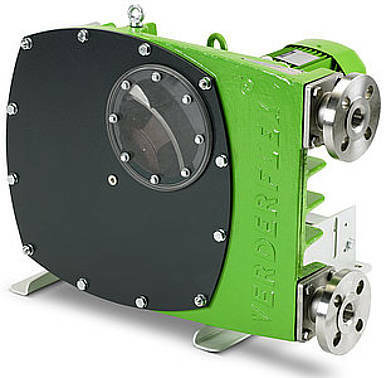 The company was so satisfied with the performance of the Verderflex peristaltic hose pumps that they installed many more of these pumps as a long-term solution to their slurries pumping problems. The Verderflex hose pumps are highly efficient in the transfer of slurries and require minimal maintenance since the main part of the pump that comes in contact with the hazardous slurries is the hose that has long life. Even replacing the hose is an easy task.